Poinsettias are a tropical plant in the Euphorbia family. Because of their tropical nature they cannot tolerate temperatures below 55F. So unfortunately, they are not the best decision for an outside planter or an unheated area, here in Virginia. But they are a perfect addition anywhere on the inside of buildings. The ideal location is a room that doesn’t get direct sunlight, and without significant drafts. Include them gift baskets, holiday centerpieces, or just because! When selecting a poinsettia, start by selecting for your favorite color. Poinsettias come in the traditional, Red and White. But with significant strides in breeding, they now are found every shade in between! Try a white with a pink splash, or a pink with a white splash, or even a bright hot pink! Once you find the color that matches your décor, select a plant that is in full color on its leaves (bracts) and hasn’t opened its small yellow flowers yet. Look for sturdy and mold free stems. Poinsettias are not extremely delicate when it comes to watering. As long as they don’t completely dry out then they are resilient in most situations. But when you water, do make sure you fully saturate the soil. 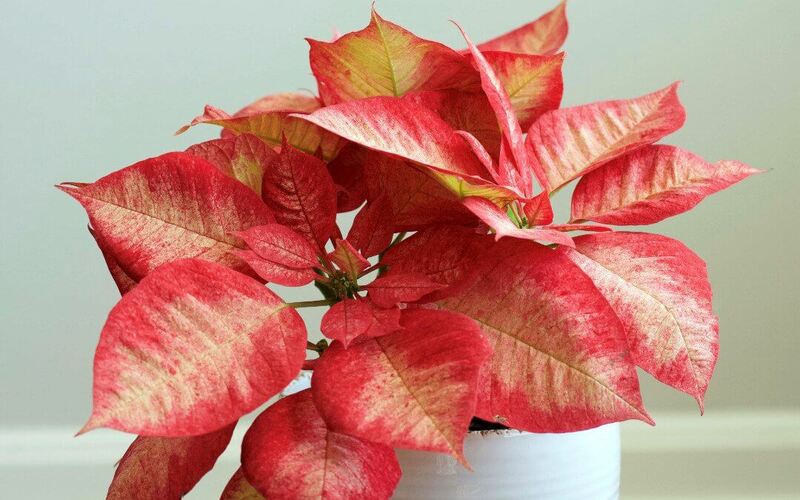 The most common downfall of poinsettias, when they are displayed in clusters or groups, is over watering. Such overwatering can lead to a fungus called Botrytis. One of the most common concerns about poinsettias is if they are toxic or not. The short answer is, you would need high concentrations of poinsettia extract in order to have adverse effects. However, because the milky sap of these plants contain latex, it is possible that people with latex allergies may have a skin reaction. If I haven’t proved to you how cool poinsettias are…check out this tid-bit of information! If you’re ready to add poinsettias to your holiday decorations, or just want a few to give as a gift, we would love to send some your way! Shoot us an e-mail at info@modernfoliage.com so we can get you on our holiday décor list!